Think of this as breakfast morphed into dessert: maple syrup, bacon, waffles—if they were served with vanilla malt! This is a stellar pairing of flavors, nothing held back. Don’t even think of using a fine-grade maple syrup like light or even medium amber. Go for the robust, dark stuff to stand up to the excesses. 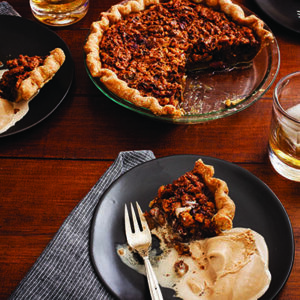 Excerpted from À LA MODE: 120 Recipes in 60 Pairings : Pies, Tarts, Cakes, Crisps, and More Topped with Ice Cream, Gelato, Frozen Custard, and More by Bruce Weinstein and Mark Scarbrough. Copyright © 2016 by the authors and reprinted by permission of St. Martin’s Griffin. Photo Copyright © 2016 by Eric Medsker. 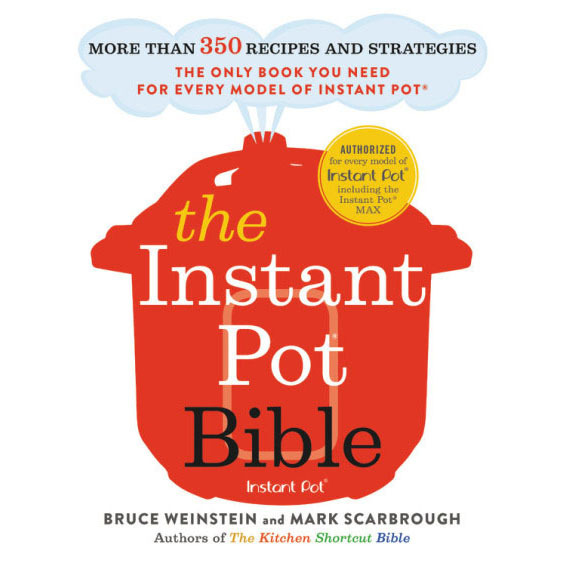 Listen to Mark describe this recipe on The Faith Middleton Food Schmooze®. Even if you like your morning bacon limp, fry it crisp enough that you can shard it into pieces. These will soften in the pie, providing a distinctly porky flavor to go with the walnuts and maple syrup. You don’t want to burn the bacon—doing so can add unpleasantly bitter notes. But get it crisp enough to stand up to the long baking time and still release lots of sophisticated, caramelized flavor without ending up as chewy, rubbery bits. TO MAKE THE CRUST: Fry the bacon, turning occasionally with a fork, in a large skillet set over medium heat, until crisp, 3 to 4 minutes. Transfer the bacon to a paper towel–lined plate and set aside. Reserve 2 tablespoons of the rendered bacon fat from the skillet, then measure the remainder of the fat in the skillet into a heat-safe liquid measuring cup. Cool for 10 minutes at room temperature. Add enough solid shortening so that the total volume in the cup measures 6 tablespoons (¼ cup plus 2 tablespoons). Pour the flour into a large bowl and add the combined fat in the measuring cup. Using a pastry cutter or a fork, work the fat through the flour until the mixture resembles coarse cornmeal. Stir 2 tablespoons of cold water and the vinegar in a small cup or bowl. Add to the flour mixture and stir until a soft, pliable, but not sticky dough forms, adding more cold water in 1-teaspoon increments as necessary. Gather the dough into a ball, dust it with flour, and roll it into an 11-inch crust. Center and set the crust into a 9-inch pie plate. Trim the edges and flute them as desired. TO MAKE THE FILLING: Beat the eggs, maple syrup, the white and brown sugars, and the vanilla extract in a large bowl with an electric mixer at medium speed until smooth and uniform, even a little foamy at the top. Beat in the reserved 2 tablespoons bacon fat. Working by hand, crumble the bacon into tiny bits in the bowl. Stir in the walnuts until well combined and pour into the prepared pie crust. 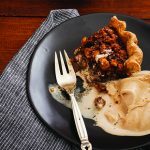 TO FINISH THE PIE: Bake the pie until puffed and brown, until there is only a slight jiggle in the filling at the center of the pie when the rim of the plate is tapped, about 55 minutes. Cool the pie on a wire rack for at least 1½ hours or to room temperature before slicing into wedges to serve. Store tightly sealed with plastic wrap in the refrigerator for up to 2 days. TO MAKE THE CUSTARD: Stir the cream, milk, malt, and vanilla extract in a large saucepan set over medium heat until the powder has mostly dissolved and small bubbles form around the inside perimeter of the pan. Meanwhile, using an electric mixer, beat the egg yolks, sugar, and salt (if using) in a large bowl until thick and pale yellow, until wide ribbons slide off the turned-off beaters, about 4 minutes. Beat about half the hot cream mixture into the egg mixture in a slow, steady stream until smooth, then beat this combined mixture into the remaining cream mixture in the pan. Set the pan over low heat and cook, stirring constantly, until the mixture thickly coats the back of a wooden spoon and the temperature registers 170°F, 4 to 7 minutes. Strain the mixture through a fine-mesh sieve into a bowl and refrigerate for at least 4 hours or up to 2 days, covering once the mixture is cold. TO FREEZE THE CUSTARD: Prepare an ice-cream maker. Stir the cold custard and freeze it in the machine according to the manufacturer’s instructions, until you can scoop up a small mound with edges that do not immediately start melting. Store in a sealed container in the freezer for up to 1 month. Instructions for each component refer to the specific ingredient list for that component. Example: The filling's instructions call for you to "beat the eggs." The instructions are referring to the 3 eggs in the filling's ingredient list (not to be confused with the egg yolks listed in the custard's ingredient list). The pie and the custard are distinct recipes. PRO TIP: A nut pie is underdone (and gooey) if its center moves in waves when the side is tapped. However, it is overdone (and dried out) when the middle is firm while the pie is still in the oven. Remove it from the oven when there's a slight giggle in the center. A LA MODE IT: Yes, serve slices with scoops, as usual. But to take the pair over the top, fry up a couple of extra bacon slices and crumble over the scoops. PRO TIP: Malted milk powder is a combination of barley, malt, wheat, milk solids, and sometimes salt. Check the label—although we like a little salt in this frozen custard, you may already be adding some with the malted milk powder and therefore don't need more. Do not confuse malted milk powder with diastatic malt powder, a bread-baking additive with enzymes that break starches into sugars.